Iranian kebab is one of the most favorite and well known Iranian traditional foods. Kebabs are made based on various recipes. That’s why you see a long list of them in Iranian restaurants’ menus. 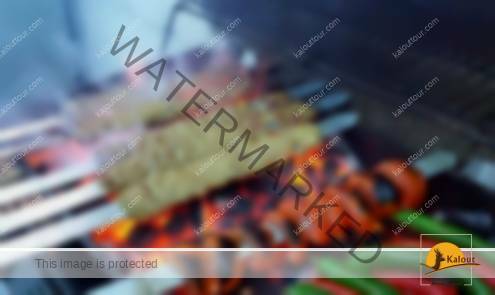 What you read here is how to grill Kabab Koobideh, which is the ground meat version of it. There’s a whole range of various types of Kebabs grilled in Iran. People use their oven’s grill at home or a metal short-legged or long-legged barbeque to make this food outdoor on the gentle heat of fiery charcoal. Iranians have referred to Kebab in their literature for centuries. It’s even well known outside of Iran and has its own fans across the world. 1. Put grated onion in a sieve and press it to release and discard the juice. 2. Put the crushed saffron in a cup and add two small ice cubes. Set it aside and let the ice cubes melt slowly. 3. Mix ground lamb and ground beef in a large bowl and knead them well. Then add grated onion, soaked saffron, black pepper powder, and salt. Mix them with the meat thoroughly into a smooth paste. When you’re done, cover the bowl with cellophane and refrigerate it for 2-3 hours. 4. Remove the bowl from the fridge and get ready to skewer the Iranian kebab. Take a bowl of cold water next to yourselves. Wet your hands in cold water. Take a handful of the mixture and make a ball. Place a wide metal skewer on it and start spreading the meat ball around the skewer. To do this, use your thumb and index finger. Continue with the rest of mixture and skewers. Use a little bit more pressure at both ends of your meat spreads. It helps the meat to stick more securely to the skewers while grilling. Leave a few inches from the tip and handle of the skewers free for grilling. The mixture should be about ½ inch thick around the skewers. Put the prepared skewers on a tray with raised sides to avoid meat touching the surface and refrigerate them for a while. 5. Arrange the prepared kebabs on a grill. To avoid the meat falling off the skewers on the heat, start turning the skewers right away in order that you’ve arranged them. Do it for a few minutes until both sides of the kebabs start grilling at the same time. After that you can let one side grill completely and then turn it to the other side. It’s necessary to follow this instruction. If you wait for one side to get grilled completely while the other side is raw and then start turning it, the meat can’t stick to the skewers and falls apart. 6. Place the grilled Kabab Koobideh between two sheets of bread and pull out the skewers. It’s time to enjoy your home made Iranian Kebab! Grind your meats two or three times. The more you grind it, the smoother and stickier paste you will have. Don’t add turmeric to your mixture ever! It spoils the taste. If your skewers are new, you’d better put them on heat for a while and then start using them after getting cold. Otherwise, it would be probable that the meat fall off the skewers. Your mixture for this kind of kebab have to be made up of lamb only or a mix of beef and lamb. It’s not possible to use just beef because it’s not fatty enough. Kabab Koobideh is best served as such! Serve it on a platter with sheets of Lavash or Sangak bread (Iranian traditional breads). Each person can take a kebab on their plates, cut it to small pieces, wrap it in a piece of bread, and eat it. Serve it with rice. That’s what Iranians call Chellow kabab. You’ll need a spoon and fork to eat it. In Iran, it’s almost served with a small stick of butter on the side which gets melted slowly by the heat of your dish. You can spread it over the rice or kebabs based on your taste. Most of the people use a spoon and a fork to even cut the Kabab Koobideh, not a knife, but you can ask for it if you’re in a restaurant and it’s not already placed in front of you. You can decorate the kebabs with some sumac and most commonly used table vegetables, parsley and basil. For Iranians, the most favorite side dish with this food is grilled tomato. But there can be some others like Yogurt, table vegetables, lemon (to squeeze it and spread the juice on kebabs), or raw onion (chopped into pieces). The most favorite beverage with Iranian kebab or Chelow kabab is Doogh (Iranian yogurt drink) seasoned by dried mint powder or some other local herbs. If you’re in Iran, no matter in which city or area, you can have this food in your menu. So, don’t be in doubt, order it! And if enjoyable, I’m sure it will be, try this recipe to repeat this amazing taste experience for yourselves and share it with your family or friends at home.